The first cohort of millennials entered the workforce around the time of the Great Recession, when the economy was sputtering. Combine that fact with the constantly changing make-up of the modern economy and you have a uniquely difficult employment situation for working millennials. Below we look at the data to see how millennials have responded and to find the most popular jobs for millennials. In order to find the most millennial-dominated jobs, we looked at Bureau of Labor Statistics’ Current Population Survey. We looked at data to find where millennials made up the highest percentage of employed workers in each occupation. For the purposes of this study, we defined millennials as those between the ages of 25 and 34 in 2016. Check out the data and methodology below to see where we got our data and how we put it together. The internet – The internet has changed how almost everyone does their jobs. However, three of the occupations on this list owe a great deal of their growth and prominence in this ranking to modern technology. Occupations like statisticians, web developers and television, video and motion picture camera operators and editors are all occupations that have a high concentration of millennials. Because most millennials came of age with the internet, they may have a slight advantage over other generations in these occupations. Physically demanding – Three of the occupations with the highest concentrations of millennials are physically demanding. 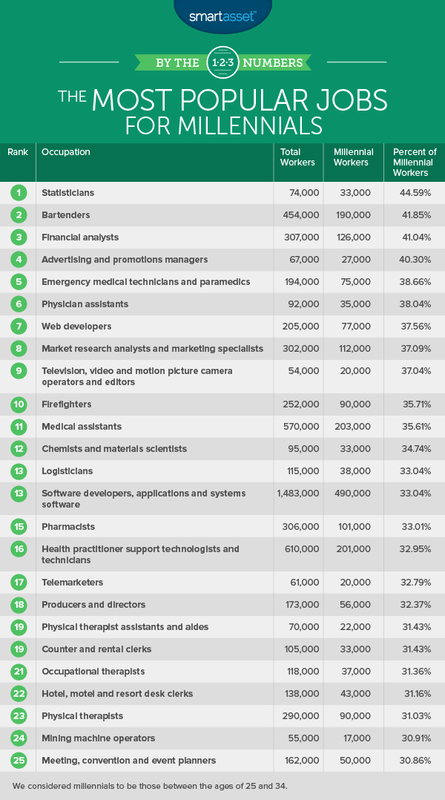 These occupations are bartenders, firefighters and paramedics. Lack of experience – Some of the occupations millennials are the least likely to be employed in require many years of experience, something most millennials don’t have yet. For example the occupations with the fewest millennials are judges and chief executives. Dying jobs – Millennials also seem to be avoiding jobs on the decline. Example of this include travel agents (just 12% of travel agents are millennials) and tailors, dressmakers and sewers (9% of are tailors, dressmakers and sewers are millennials). According to BLS data on job outlook, the number of travel agents is expected to drop by 9% over the next decade. This profession has the highest rate of millennials among its ranks (44%) and the median statistician is 35 years old. Of the 74,000 statisticians in the country, 33,000 are between the ages of 25 and 34. This is one occupation which millennials are well placed to succeed in. The advent of big data availability and new technology to analyze it has made being a statistician a fast growing and lucrative occupation. The second occupation which is most likely to be filled by a millennial is bartending. There are about 454,000 bartenders in the U.S., 190,000 of whom are between the age of 25 and 34. Bartenders are not particularly well paid, the median bartender earns only $20,800 per year. That will make it hard for millennial bartenders to save up to buy a house or save for retirement. But there are some areas where bartenders do earn more. In the Kahului-Wailuku-Lahaina area of Hawaii, for example, the average bartender earns about $45,500 per year. Financial analyst is a popular occupation for graduates with bachelor’s degrees. Our data shows there are about 307,000 financial analysts in the U.S. and 126,000 of them are millennials. That means about two in five financial analysts are millennials. This is a great career option for millennials and non-millennials alike. The average financial analyst makes almost $82,000 per year or about $39 per hour. The BLS also expects this occupation to grow faster than average over the coming years. These are the people who plan advertising policies or programs to increase business for a company. They are typically paid well. The average advertising and promotions manager makes over six figures. About 40% of the 67,000 advertising and promotions managers are millennials. To be hired for this role you typically need multiple years of experience and at least a bachelor’s degree. There are about 194,000 EMTs and paramedics in the U.S. About 38%, or 75,000 of them, are between the ages of 25 and 34. To become an EMT you will need a special certification but no specific on-the-job training. The BLS expects this occupation to grow faster than average. Because of the stressful nature of this occupation, it is perhaps not surprising that’s it’s mostly done by younger people. The BLS describes this occupation as “physically strenuous” and “sometimes involving life-or-death situations”. Physician assistant is a great option for someone who wants to work in the medical field but does not want to take on all the student debt that may be required to become a doctor. To become a physician’s assistant, you will need at least a master’s degree but you could earn upwards of $101,000 per year. The median physician’s assistant is 39 years old, and about 38% of them are millennials. In general the healthcare field is one of the fastest growing. This is especially true for occupations like nurses or doctors. The internet is a key component in the modern economy. Many millennials have taken advantage of the new internet economy and become web developers. In fact, the data suggests the stereotype of the young web developer is true. Just under 38% of all web developers are between the ages of 25 and 34. If we include anyone under the age of 34 that number jumps to 46%. The average age for web developer is 37. This group of individuals conducts research on the feasibility of products in local and national markets. There are about 300,000 people employed in this occupation across the country. 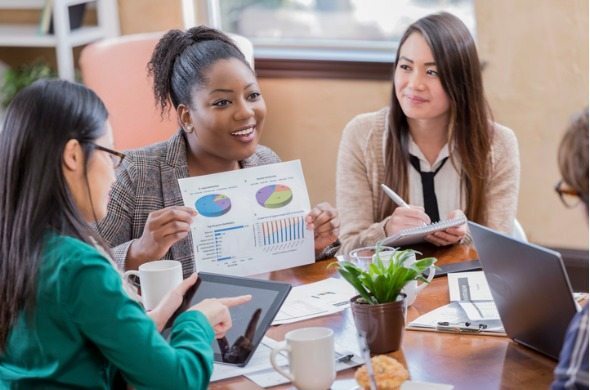 Market research analysts tend to be found in the big cities like New York, Los Angeles and Washington, D.C. About 37% of market research analysts are millennials. This occupation barely made our cutoff. There are about 54,000 people employed in this occupation 20,000 of whom are millennials. The BLS projects growth for this occupation, thanks to platforms like Netflix and HBO. With increased demand for online video comes increased demand for camera operators and video editors. Firefighting, like paramedics, is a young person’s occupation. This work can be dangerous and physically demanding. The median firefighter is 38 years old. Of the 252,000 firefighters in America, 90,000 are millennials. The average firefighter makes $48,000 per year. Total number employed in an occupation. This is the overall number of people employed in an occupation. Data comes from the Bureau of Labor Statistics’ Current Population Survey for 2016. Millennials employed in an occupation. This is the total number of millennials employed in an occupation. Data comes from the Bureau of Labor Statistics’ Current Population Survey for 2016. We ranked the occupations according to which had the highest concentration of millennials. To find this we divided the number of millennials employed in an occupation by the overall number of people employed in an occupation. As our data showed there can be a very large divergence between the types of jobs millennials do. Some pay over six figures, while others pay barely $20,000. Here are some tips for moving from one to the other. Get an education. All the data available from the BLS points to the fact that getting an education will boost your lifetime earnings. You don’t even necessarily need a STEM degree either, any degree can boost lifetime earnings. Student debt is a legitimate worry, but there are smart ways to handle it. Professional certification. If you cannot get back to school, consider getting a professional certification. For example, to become a firefighter or a paramedic you do not need a college degree but you do need to complete a professional certification program. Both occupations are growing and pay fairly well. Do research. Not every occupation is a good fit for everyone. Make a list of your skills and aspirations and find which occupation fits you best. This way you can spend less time looking for work which may not be appropriate for you and prevent yourself from making another career switch in the future. Talk to an expert. Changing careers can have an impact on your budget and your long-term financial planning. A matching tool like SmartAsset’s can help you find a financial advisor to work with to meet your needs. First you answer a series of questions about your situation and your goals. Then the program narrows down thousands of advisors to three fiduciaries who meet your needs. You can read their profiles to learn more about them, interview them on the phone or in person and choose who to work with in the future. This allows you to find a good fit while doing much of the hard work for you.